Bitcoin is the granddaddy of all cryptocurrencies and was the first of over a thousand digital coins that are available in the market today. 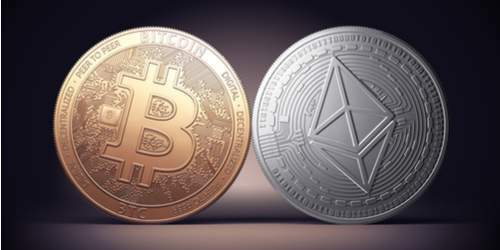 Ethereum, created by Vitalik Buterin, has been in second place over the last couple of years, but when you start comparing Ethereum vs Bitcoin, you will realize that both cryptocurrencies have many similarities and major differences. When looking at Ethereum vs Bitcoin, let’s first look at the similarities. The primary similarity is the fact that they are both driven by the simple principle of cryptography and distributed ledgers. But they are quite technically different because Bitcoin uses programming languages that are stack-based while Ethereum uses Turning complete. The biggest difference is block time as Bitcoin takes minutes to confirm a transaction while Ethereum takes seconds to complete the same task. However, when you look at Ethereum vs Bitcoin in a general sense, these cryptocurrencies differ in purpose. Ethereum was created as a platform to facilitate peer-to-peer applications and contracts via its own currency vehicle. Bitcoin, on the other hand, was developed to work as an alternative to traditional money making it a platform to store value and to complete payment transactions. This means that the digital currency Ether isn’t trying to monetize the workings of Ethereum to design and run distributed applications (ĐApps). What does it all mean for cryptocurrency investors? Ethereum vs Bitcoin from an investment perspective, they are both viable investment channels. This is because the popularity of Ether along with its market capitalization brings it in competition with all cryptocurrencies (including Bitcoin), even though it wasn’t created to achieve this objective. The market cap for Ether is now more than other digital currencies like Litecoin and Ripple. However, all these cryptocurrencies are quite far behind the one that started it all, Bitcoin. What does the future hold for these digital currencies? Whether it’s Ethereum vs Bitcoin or Litecoin vs Ripple, it’s nothing like forex trading. As a result, investors just entering the cryptocurrency marketplace need to be acutely aware of its highly volatile nature. What’s more, as it’s not regulated by any government body and as it’s also a highly attractive target for hackers, this investment channel has to be approached with much caution. As a result, we can’t predict the future of these cryptocurrencies with any confidence. However, it’s also important to note that Bitcoin survived the infamous Mt. Gox incident and a ban by the Chinese government to reach new heights. So you can bet there these leading digital currencies aren’t going to go away anytime soon.